(Oregon Coast) - There are moments when the most interesting times at the beach aren’t really on the beach at all. Simply ogling the scenery from the safety and warmth of your car is one of those long-standing American traditions, especially when autumn rolls around. As more wintry weather encroaches on Oregon’s coastline, bringing with it the tempestuous storms as well as the colors of fall, the region is the other fall drive favorite of Oregonians and travelers from elsewhere. Sure there are mostly big, exploding waves and tiny burghs with charm-inducing architecture, but autumn too wraps its vibrant flag around the foliage of the coast, creating a unique atmosphere and vibe that only the ocean shoreline can. The fog and mists of the season is also something you’ll catch sight of, along with interesting tidal action and perhaps the striking oddity or two, such as sea foam so frothy it gets thrown onto the highway like small flurries of surreal snow. When travel to the coast becomes more concentrated on staying out of the weather rather than walking around in it, this when the fall drive becomes a bit of a necessity. Still, the pleasures you can take in from the comfortable vantage point of your moving vehicle can be thoroughly memorable, even unforgettable. Secret, deserted beaches abound in this area, where even on high-density days like Memorial Day, summer weekends or such, you'll find less people. Try Bob Creek Wayside, where more tide pools populate this obscure but fascinating place. They really emerge at lower tides, clinging to odd, mushroom-shaped rocky blobs at the southern end. At this end, there's also a small sea cave and a huge boulder that creates a sort of arch by leaning up against the cliffs here. At the north end, you'll find plenty of mussels - but you'll have to cross the creek to do so. During the winter that's difficult, if not impossible and certainly unwise. Most of the beaches here are a mix of sandy stretches and large basalt structures - perfect for exploring and climbing. Spots like Bob Creek, Neptune State Park and Strawberry Hill contain dozens of craggy marvels. All the while, you're driving above the ocean, with a constant stream of splendid views and beach accesses like these, mere steps from their parking lots. On this route, you'll also find the Cummins Creek Trail, where hikers can wander up the mountain above this shoreline. The oldest town west of Mississippi lies right here in Oregon and is filled with layers of historical significance beyond that achievement. Just south of here, at Fort Clatsop, Lewis & Clark set up camp in 1805. There was a nasty fight over the town between Britain and the U.S. not long after the Corps of Discovery left. And there was a horrid prevalence of the act of "shanghaiing" in this port town for a time (where able-bodied men were drugged and woke up to find themselves working on a sailing ship). Astoria's maritime traditions are still evident today - beyond the enormous ships which pass through, to and from, the mouth of the Columbia. With the majority of the town squeezed into some leg pain-inducing steep hills, the streets are crammed with awe-inspiring Victorian mansions (most of which are on the national historical register). You'll find yourself mesmerized by these gorgeous structures and the near overdose of quaintness and history this town exudes. Grandiose viewpoints - both high and not so high - line this twisting, turning highway, and give way to unforgettable vistas of endless sea. If you're coming from Depoe Bay, it all begins just south of town at Rocky Creek Wayside. Pull over here and see the waves pound the pillow basalt, or maybe spot some whales. Zip up the hill on 101 - or take the immediate right, at Otter Crest Loop, to cruise down this tiny road (which eventually becomes a one-way) to catch more amazing views. There are some hidden spots to discover here as well - if you're up for a hike. Above it, 101 meanders even higher as it reaches Cape Foulweather. There, you'll find an eye-full of ocean, as well as a funky gift shop full of wonders (see if you can find the clippings from Beach Connection/Oregon Coast Guide tacked to a wall in the back). From there, more high viewpoints front convenient turn-offs as the road slithers down the hill - with Newport's Yaquina Head Lighthouse coming into view for the first time. Soon, you'll encounter the road to the Devil's Punchbowl, Otter Crest and its various vantage points, also with no shortage of stunning ocean views. But here, you can gawk at the swirling madness of the Punchbowl (a sea cave with the top missing), where the ocean can get frightfully frenzied and frenetic during stormy weather. South of Otter Crest, the highway hovers above the beaches just north of Newport, with the pristine sands of Moolack Beach and Beverly Beach State Park streaming past as you drive. Between Lincoln City and Pacific City you'll find the forested corridor that twists and winds up and down huge hills, and takes you away from the beach for a while. Soon after Lincoln City, you'll pass access roads to Cascade Head and its hiking possibilities, as well as Three Rocks Road (the route to the arty Sitka Center). The entire drive, fall colors are especially vibrant, as you pass through tunnels of towering trees covered in autumn’s flag. The sleepy, distinctly noncommercial village of Neskowin appears soon. Not long after that, huge, dramatic hills and basalt walls flank you on either side, covering your view of the ocean. The road rises and falls here, periodically allowing viewpoints to pop into view. About two miles after Neskowin, you'll find a secret beach access at the road marked Wenema Road. It's a spectacular place, where hardly another soul is to be found, coming complete with pristine, untouched sands, climbing possibilities on the cliffs and a large blob of a sea stack. 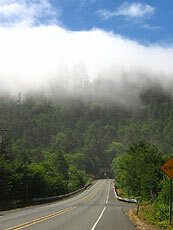 Highway 26 runs from Portland to the north coast, and through dense forests, with several stunning viewpoints along the way, overlooking small, comely valleys. About 15 miles from the Cannon Beach/Seaside junction, you can take squiggly, wormy Highway 53 for a beautiful (but somewhat white knuckle drive) shortcut to Wheeler, where each twist and turn reveals another chunk of primitive forest. As you get into the farmlands of Tillamook County, the close knit, small mountains of the coast range can resemble Europe. When blobs or blankets of mist sit lodged in them, they can look like ghosts just hanging out near the peaks. Highway 18 wiggles from Portland to Lincoln City (eventually joining with Highway 22 from Salem), wandering through the wine country of Yamhill County. It's easy to get distracted in the wine tasting possibilities here and never make it to the coast. But fall colors are especially shattering in this area, where they literally explode all over the route. Wander off the highway into the backroads near Sheridan and discover some amazing hidden parks that will blow your mind. The Van Duzer Corridor, just outside Lincoln City, is jam-packed with forested wonders, like secret hiking paths and inviting streams in great abundance. Highway 34, between Corvallis and Waldport, is a long, winding scenic route, full of funky rock structures that surround streams, veiled parks and more deep forests. 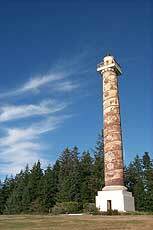 One major attraction you shouldn't miss is Marys Peak - the highest mountain in the coast range. It sits just outside Philomath.